God has spoken. God has promised. But the fulfilment has not reached you yet. You wonder if you heard right. You get confused. Was the promise too good to be true? Earlier in Matthew 20, Jesus told his disciples that he would suffer, die and then rise again. Though the disciples did not know what Jesus was talking about, Jesus knew full well what was ahead. He knew the incredible pain that was to come and the immeasurable joy that was promised. And yet, immediately after baring his soul to the disciples, real life set in. The disciples began squabbling about who was the greatest in the kingdom of heaven. They surely did not understand Jesus’ real mission and all that was ahead. As Jesus waited for his end to come AND the promise of resurrected life, what did he do? How did he act? How do act when your promise is taking a long time for fulfilment? How quickly do you turn inward and lose hope? What did Jesus do? He kept serving. He served the disciples through his patient discipleship. He lived real life, one step at a time, making specific choices to keep serving. And he told his disciples to do the same. 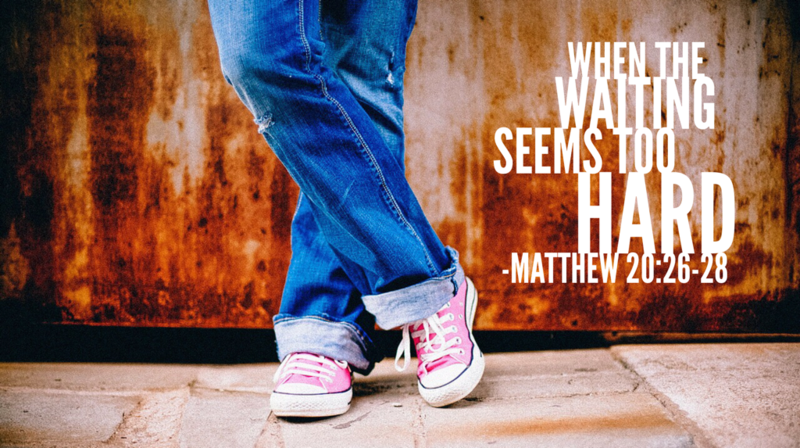 While you wait, hold onto hope and serve. This is not wasted time. God is fulfilling his promises to you even now. But don’t sit on your hands. Get in there. Get your hands dirty and serve. Hope is stirred up within us as we serve. Hope is drained out of us when we focus inward. Be like Jesus. Serve on your way to the fulfilment of a great promise.